Anchor: Prosecutors said Friday they questioned former Supreme Court Justice Cha Han-sung this week in connection with allegations of power abuse. It’s the first time a former Supreme Court justice has been summoned since a probe into the matter was launched in June. Lee Bo-Kyung has the story. Report: Cha Han-sung headed the National Court Administration(NCA), the administrative body of the Supreme Court under Yang Sung-tae, from October 2011 to February 2014. 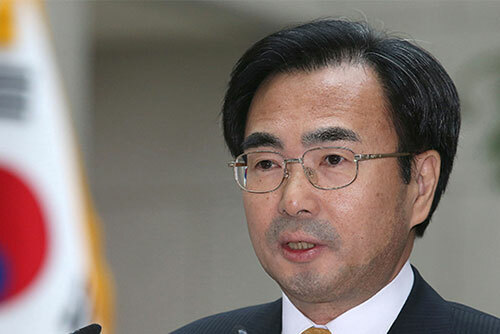 He underwent questioning on Wednesday regarding the top court's alleged meddling in politically sensitive trials to gain favors from the previous Park Geun-hye government. Cha and former Chief Justice Yang are suspected of deliberately seeking to delay a Supreme Court ruling in a civil lawsuit by Koreans forced into labor during the Japanese colonial era. In an earlier raid of the Foreign Ministry, prosecutors confirmed Park's presidential chief of staff Kim Ki-choon met with Cha and then-Foreign Minister Yoon Byung-se at his office in 2013. During that meeting, Kim reportedly requested the top court not to uphold a previous ruling in favor of the plaintiffs and to ensure the case will be tried by a full-bench court as a way of delaying a verdict. The Park administration at the time was seeking to improve relations with Japan. Former Supreme Court justices Ko Young-han and Park Byoung-dae are also expected to face questioning in the near future, as is former Chief Justice Yang himself. Lee Bo-kyung, KBS World Radio News.